Diesel Treat 2000™ Ultra Low Sulfur is an ashless, all-season fuel additive formulated for use with all types of diesel fuel, especially low sulfur and ultra low sulfur diesel fuels. Diesel Treat 2000™ contains a highly concentrated, multi-functional additive system to improve fuel economy, injector cleanliness and fuel stability and to optimize performance. 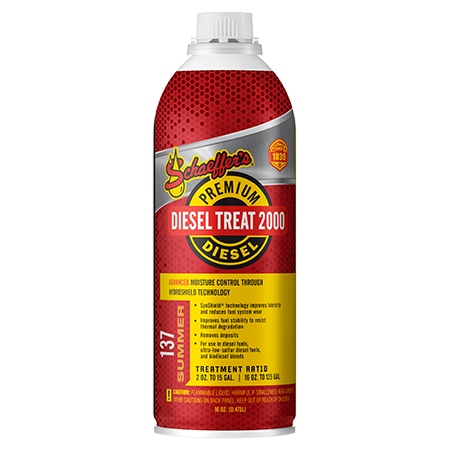 Diesel Treat 2000™ contains a non-alcohol jet fuel deicer/water dispersant to remove moisture present in the fuel and prevent the formation of stable-fuel-water emulsions. Further blended into Diesel Treat 2000™ is our proprietary lubricity additive, SynShield®, which prevents fuel system wear and injector scoring for longer component life. Disperses insoluble gums and varnish present in low quality fuels. Excellent deposit control for light duty and medium duty in-direct injected diesel engines. Improves fuel’s cetane rating up to 4 points.